Manufactured by: Phase Matrix, Inc.
Measurements: Frequency, Power, Pulse width, Pulse, Pulse freq. 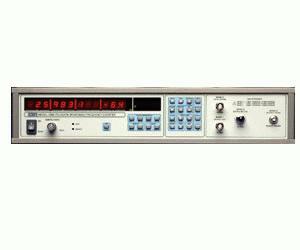 The Phase Matrix Pulse/CW Frequency Counters 595A / 598A add practical peak and CW power measurements to the capability of the 585C/588C with an optional internal delaying pulse generator for the ultimate in ease-of-use. These models offer automatic and self contained frequency and power profiling that is ideally suited to such applications as chirped radar characterization, carrier frequency measurement, pulsed radar analysis, VCO measurements, and frequency agile system analysis over a range up to 170 GHz (depending upon models and options selected).